Hasu is an intuitive and knowledgeable Yogi. 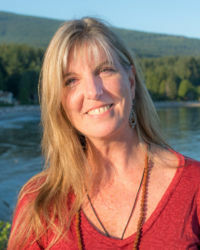 For nearly 25 years, she has shared a flowing practice which creates self alignment and attunement, based on teachings from her own life experience, Kripalu Yoga, Amrit Yoga, and Phoenix Rising Yoga Therapy. The focus is on exploring sensation through movement and stillness, while drawing on the breath as a tool for transformation, allowing you to explore your inner edges and thresholds with willful practice and mindfulness; learning how to trust, accept, experience peace with ourselves and life, by deepening the connection with the vital life force, and adding a sense of ease to one’s life. From here, we learn how to carry what is experienced on the mat into daily interactions. Life becomes a waking meditation. Initiated into the Kripalu Lineage by Gurudev, Shri Amritji Desai, with the spiritual name Hasu, meaning Joyous One. She was recently recognized as Senior Training Faculty for the Amrit Yoga Institute. She has trained over 70 teachers here at Yoga by the Sea, In both the 200 hour YTT and the 300 hour Advanced Yoga Training. If you have any questions about the yoga centre, or are interested group or private bookings contact her directly at marney@yogabythesea.ca.